Amazon is shutting down Vendor Express, one of its wholesale programs that made it easier to sell in bulk to Amazon, according to an email seen by CNBC. The company said it will stop issuing orders as of May 21, and shut the program entirely on Jan. 2, 2019. In the email, Amazon told merchants to sell on the third-party marketplace instead. Three years ago, Amazon launched a program called Vendor Express to make it easier for wholesalers to get inventory onto the e-commerce site and avoid having to go through the company's invite-only Vendor Central portal. It was a short-lived experiment. 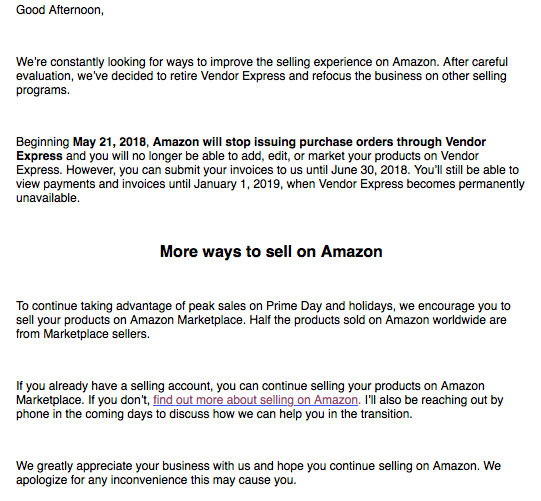 Amazon said Monday that it's closing Vendor Express. The company told sellers in an email, which was obtained by CNBC, that it will stop taking orders as of May 21, and that the program will become "permanently unavailable" starting Jan. 1, 2019. "We're constantly looking for ways to improve the selling experience on Amazon," the email said. "After careful evaluation, we've decided to retire Vendor Express and refocus the business on other selling programs." Amazon confirmed to CNBC that it's ending Vendor Express and said the program's vendors will be "transitioned to alternative ways to sell on Amazon." Vendor Express was launched in 2015 as a new channel for small businesses to sell products in bulk to Amazon, whether it was their own private label brand or other items that they wanted to unload. Unlike Vendor Central, which is targeted at large brands and sellers and requires a thorough vetting process for approval, Vendor Express offered a quick onramp for smaller merchants to have products listed under the tag, "sold by Amazon." Amazon didn't say why it's eliminating Vendor Express. But according to Amazon sellers who spoke to CNBC about the program, it was fraught with counterfeits from its early days and likely failed to gain traction among high-quality sellers. One vendor, who asked to remain anonymous, said that although Vendor Express asked for samples and certain registration forms before placing large orders, the process wasn't strong enough to ensure authenticity. "It might be that Amazon realized that the quality of brands was not there and the return on this program was not good enough," said Joe Kaziukėnas, CEO of Marketplace Pulse, an e-commerce research firm. "Amazon would rather have those sellers manage their own risk and sell as third-party sellers." In the email, the company encouraged merchants to instead sell their products on the Amazon marketplace, where they act as their own retailers and often plug into Amazon's logistics and shipping systems. Amazon's marketplace has grown rapidly in recent years and now accounts for over half of all products sold on the site. Between the third-party marketplace and the invite-only Vendor Central program, Vendor Express was stuck in the middle without a clear benefit, sellers said. Will Tjernlund, a managing partner at Goat Consulting, which helps Amazon sellers, said that the bigger brands are already wholesale vendors while smaller sellers prefer the marketplace, where they get to set the price and directly engage with customers. Additionally, the cost to vet less qualified sellers may have been too much to sustain, he said. "It just took up too much support and time for something that generated very little revenue," Tjernlund said.